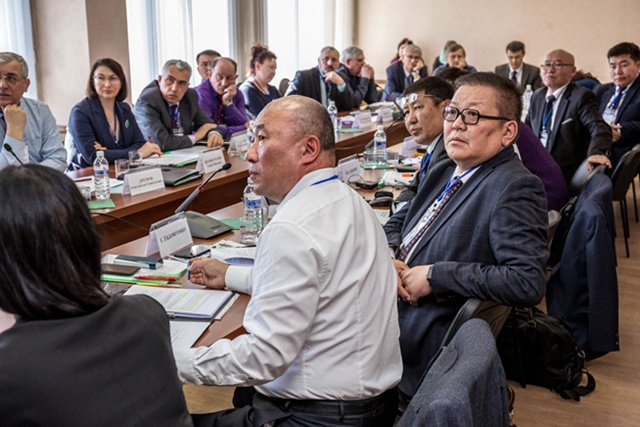 To ensure bilateral cooperation the Mongolian-Russian Sub-working group was established to discuss the draft ToR of REA of hydro-technical facilities’ projects which are being planned to be implemented by Government of Mongolia in the catchment of Selenge River. Its key objectives include presentation of the official proposal of the Russian side and incorporating into REA ToR the recommendations which are deemed to be necessary. Agreement to review the ToR was reached by countries in October 2017, but the first meeting of Sub-working Group took place only on April 13-14, 2018 in Irkutsk City of Russian Federation, which marks another 6-month delay in REA process. During the meeting, the parties mutually exchanged the information and discussed specific proposals made by Russian side, and agreed on submission of final official proposals from Russian side by May 01, 2018. The MINIS Project did not bother to provide Russians with updated version of the REA ToR in advance, so they had to comment on a draft developed in June 2017 before review of results of 2017 public consultations . No surprise the Russian side of the Bilateral Expert Group provided approximately 150 (!!!) corrections\recommendations on Draft REA ToR and requested to consider those in the next draft ToR. The Mongolian WB MINIS Project managers promised to submit Draft ToR for REA to the World Heritage Center for review. According to Russian experts, who took part in the meeting, the main concern is willingness of the Mongolian Government to proceed with Egiin Gol Hydro project before the SEA\REA (strategic environmental assessment) and the CIA (cumulative impact assessment) for all water infrastructure plans in Baikal Lake basin have been implemented and results submitted to the World Heritage Center and the IUCN for review. The sign of that is unwillingness of Mongolian side to include Egiin Gol Hydro assessment in all relevant sections of the REA ToR. Also the MINIS officials revealed at the Expert Group Meeting that they plan to remove assessment of technological and economic alternatives from the REA ToR and conduct separate research on "least cost power\water production". So, instead of holistic assessment of alternatives the MINIS suggests to divide it into two parts – first considering technology\economy\policy (conducted outside of REA without public consultations, public oversight and transboundary consultations) and second part devoted to social-environmental impacts taken out of economic and policy context. The RwB Coalition believes that such assessment is possible only within the REA context with explicit recognition that the REA will require contracting several interrelated teams to perform interrelated tasks and all results will be subject to similar oversight and consultation procedures. So far the MINIS has repeatedly rejected the RwB proposal to hold public consultations on the draft Terms of Reference for Regional Environmental Assessment for Lake Baikal Basin, and that contradicts both the WB safeguard policies and the logic of the project development. We can only guess when the international tender to undertake the REA will take place, but likely in the second half of the 2018. All other parts of MINIS Project are also not moving forward with vague promise being made to hold new public consultations for some of coal-industry sub-components in summer 2018.